Anyone concerned with Cuban affairs will remember “D‑17” – the day in 2014 that Presidents Barack Obama and Raúl Castro simultaneously announced their intention to restore diplomatic ties and endeavor to normalize relations. Catalyzed by a year and a half of secret negotiations by senior confidants of the two presidents, bypassing normal diplomatic channels, the unexpected announcements provoked elation in most quarters. After 55 years of estrangement and hostility, the two presidents acknowledged that an alternative path based on mutual respect was both possible and desirable. Momentum toward restoring diplomatic relations is advancing steadily, but the path toward “normalization” is replete with obstacles, for there never has existed a “normal” state of affairs in U.S.-Cuba relations. Despite widespread relief and optimism, a long road lies ahead. Countless op-ed pieces have been written since D-17, and many of them have been very insightful, but the genre tends toward soundbites rather than deep analysis of the implications of change. In this context, the Center for Latin American & Latino Studies at American University and the Cuba Program at the Social Science Research Council today launch a Web Forum that delves more deeply into the ramifications of changes in U.S.-Cuba relations, drawing on the scholarship of the contributors and on the substantial body of academic research that can inform our understanding of the present conjuncture and potential trajectories in the future. Edited by Eric Hershberg and William M. LeoGrande, the Forum encompasses a variety of themes – from U.S.-Cuba relations, to hemispheric dynamics, to the consequences for ongoing political, societal, and economic change in Cuba. What does it mean to contemplate “normalization” between two countries with such a fraught history of interaction? 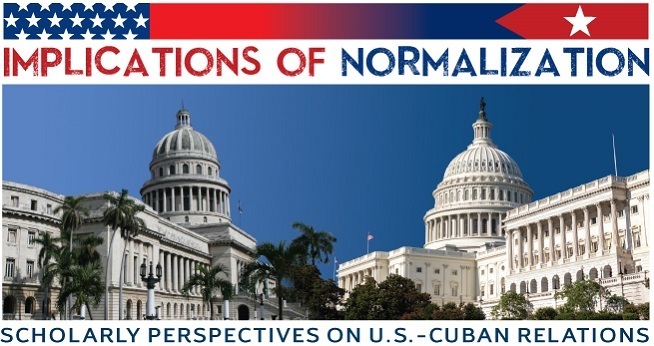 How might experiences of “normalization” between the U.S. and other countries with which it sought to reduce longstanding hostilities provide lessons for those who seek to understand the likely course of events involving the U.S. and Cuba? To what degree does D-17 and its aftermath alter the landscape of international relations in the Western Hemisphere? How might Cuban cultural production and everyday life engage differently with U.S. audiences and with members of the Cuba diaspora? Will rapprochement between the U.S. and Cuba have consequences for Cuba’s political trajectory? What impact will changed bilateral relations and a relaxation of U.S. sanctions have on ongoing efforts to “update” and perhaps transform Cuba’s economic model? The organizers hope that the Forum enriches debates about these and other matters, with contributions from leading experts from Europe, Latin America, and Canada as well as from the U.S. and Cuba. We encourage readers to download the essays and to circulate them widely. View the Forum at http://www.american.edu/clals/implications-of-normalization-with-ssrc.cfm.